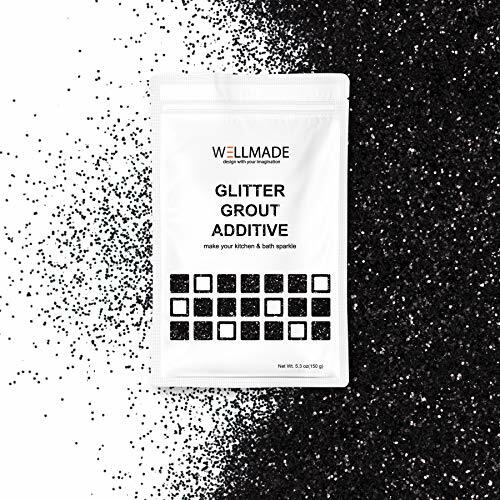 wellmade premium glitter additive adds sparkle to your kitchen or bathroom for an amazing sparkly finish. ★ Our specially designed non-toxic glitter can work with cement or epoxy based grout. ★ We recommend adding one bag of glitter to 3.5 lbs of dry grout. However, you can add more or less to get the desired glitter effect. ★ Stir your mix with dry grout and ensure the glitter is mixed thoroughly. ★ It may discolor the grout by adding too much glitter to white or light colored grout. ★ We highly recommend you to do a testing on small surface before the project begin. ★ Use unsanded grout for any glass, mirror surface backsplash tile to avoid scratching of tile surface. ★ RECOMMEND USAGE: Add 1 bag of glitter to 3.5 lbs of dry grout. However, you can add more or less to get the desired glitter effect. ★ NONE-TOXIC - Safe for DIY home usage, can work with cement or epoxy based grout. If you have any questions about this product by Wellmade, contact us by completing and submitting the form below. If you are looking for a specif part number, please include it with your message.